Lt. Abe Glitsky and defense attorney Dismas Hardy are back—on opposite ends of a medical malpractice suit…and possible murder case. When the head of San Francisco’s largest HMO dies in his own hospital, no one doubts it is anything but the result of massive injuries inflicted by a random hit-and-run car accident. But the autopsy soon tells a different story—an overdose of potassium killed him, and the attending physician Eric Kensing becomes the prime suspect in a high-profile homicide. Abe Glitsky, though hindered by the inept bunglings of two politically appointed cops assigned to the investigation, quickly sets his sights on Kensing. Desperate and in need of an attorney, Kensing turns to Dismas Hardy for his defense. But as the pressure mounts to indict Kensing, Hardy goes on the offensive, believing that the murder had little to do with his client, and everything to do with business. Hardy knows that all is not well with the HMO, and makes a terrifying discovery: too many patients have been dying, many of them victims of murder—and it looks like it is the hospital that is killing them. His own marriage tested and his family strained as he struggles to save his client, Hardy must uncover a twisting conspiracy of avarice and violence that takes the lives it is sworn to save. 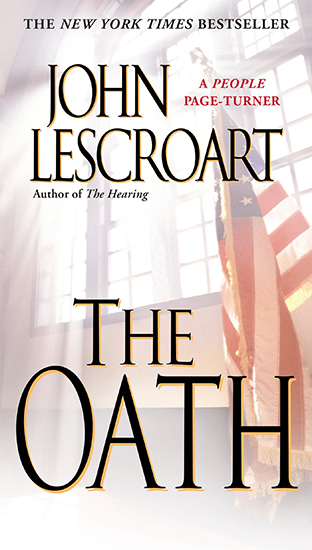 A timely and gripping novel that puts lives—and a long-standing friendship—at grave risk, The Oath is John Lescroart at his galvanizing best.